I was prepared to be swept away by the walkway that hugged the Yarra River in Melbourne, by the sheer sweep of produce that is reputed to fill the markets of the city, or even by the coffee that even the most ordinary café next door is reputed to serve. In the end, it was the Chandni Chowk lookalike that won my heart. But what was Chandni Chowk, with its warren of lanes, many too narrow to admit traffic, doing a hemisphere away? The laneways of Melbourne are organized in a grid, quite as confounding as Chandni Chowk. There are shops and restaurants on the ground floor and houses and offices on the floors above that. 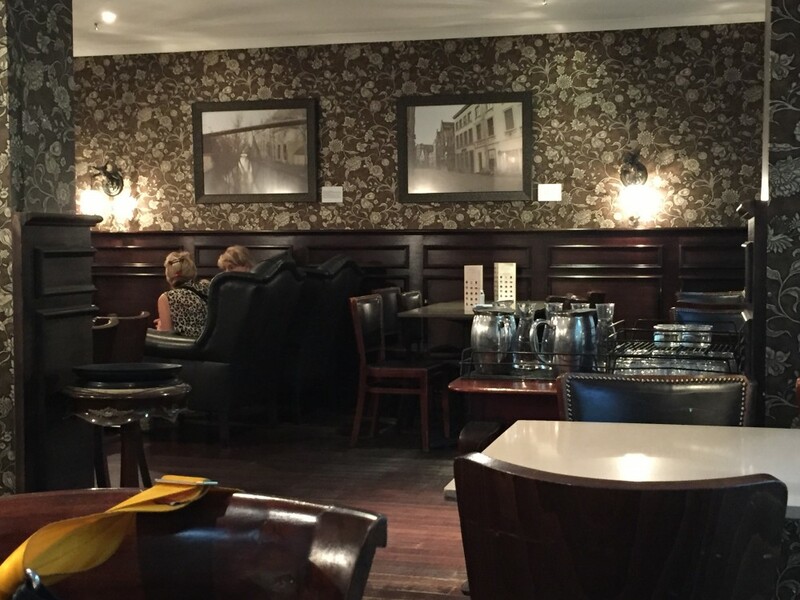 Both were built one hundred and fifty years ago and both are considered heritage areas now. But, what is the probability of seeing the same mix of spice shops, hand-made soap and perfumiers like Gulab Singh Johri Mal, and drop-dead fashionable cafes next door to soup kitchens where you can pay in advance for a bowl of soup to be donated to someone needy? You don’t have a hope in hell of wandering about either place on your own and doing justice to it, so just as you can take an organized walk for a group of people around Chandni Chowk, so can Hidden Secrets customize a walk for one or more people. First up with Danae Flanagan (who turned out to have a killer sense of direction) was Clementines, where we had a mini honey tasting. The novelty was that this honey was actually collected from on top of the very building in Collins Street where the tiny shop was. Rooftop Honey is an initiative in Melbourne to bring back bees into our living spaces and shorten the carbon footprint between honeycombs and bottles of honey. The couple of drops of honey that I sampled, squeezed in amidst hand-made butter, garden gloves and kangaroo leather clutch bags didn’t have one particular floral note, because Rooftop Honey is about letting the bees feed where they please. If I had to pick just one a-ha moment in my four days in Melbourne, it would probably have been this one. Chandni Chowk has its spice market, but so do the laneways of Melbourne. In fact, Gewurzhaus is run by the second generation of a German family. 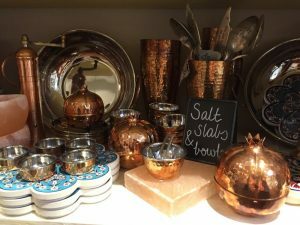 It might look like a dainty European delicatessen with quirky curiosities hung on the walls, begging to be bought, but it smells like a masala seller’s stall in Khari Baoli. The last place on the planet I would have looked for a Gujarati chai masala was in the laneways of Melbourne, but the one I encountered in Gewurzhaus could have given an Ahmedabadi a complex. 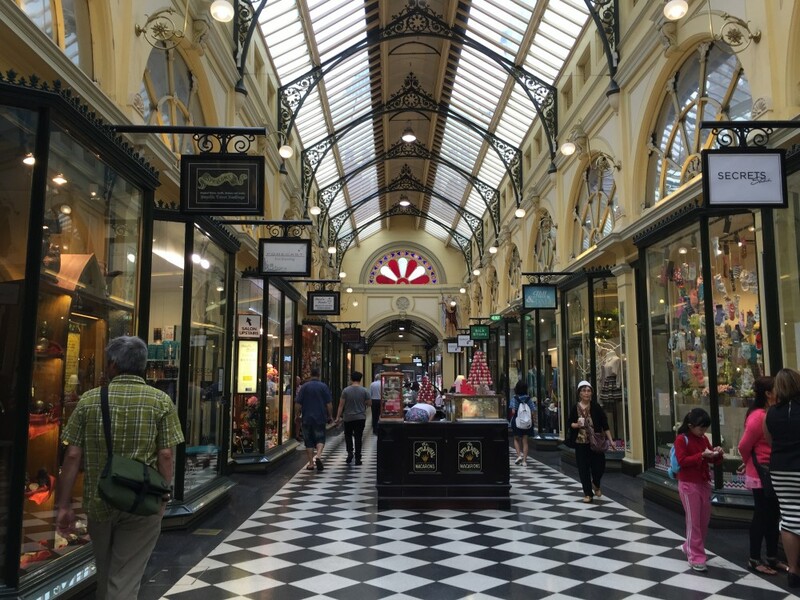 Because we were in an arcade called Block Arcade, many of the stores were eminently stylish. 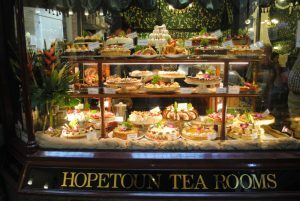 Right opposite the spice shop was a charming olde worlde tea house whose site was bought in the late 19th century for the sum of £18. 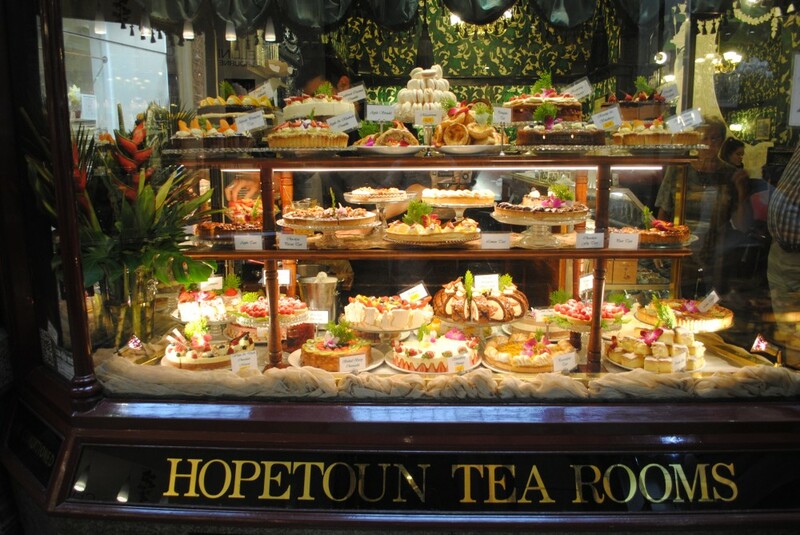 Hopetoun Tea Rooms had a window display of rows and rows of clementines, lamingtons – that most Australian of cakes, strawberry shortbread, Pavlova and Swiss rolls, and not surprisingly, are full to capacity throughout their operating hours. Though the arcades tend to be lush oases of class, style and good taste, the laneways of CBD or Central Business District range from gritty to atmospheric, with the same sense that assails you in Chandni Chowk of not knowing what to expect around the next corner. No sooner that Danae Flanagan and I had finished our coffee and chocolate bonbon at Koko Black that we heard the strains of a didgeridoo. 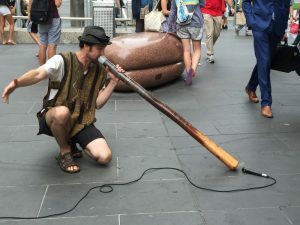 I consider myself lucky to have heard a stellar performance by a young man who had mastered the art of extracting notes from his 10 foot didgeridoo, while doing squats and sit-ups in time to the rhythm. Only the bulging vein at his temple and his flushed face told the hundred-strong audience how hard he worked for his half an hour stint at the crossroad. According to Danae, performers, most of them extremely good, were allowed a pre-arranged time at that particular part of the pavement. Chock-full of tourists, it was a lucrative spot for musicians throughout the day, as well as an efficient way to beautify the soundscape of a part of the city. 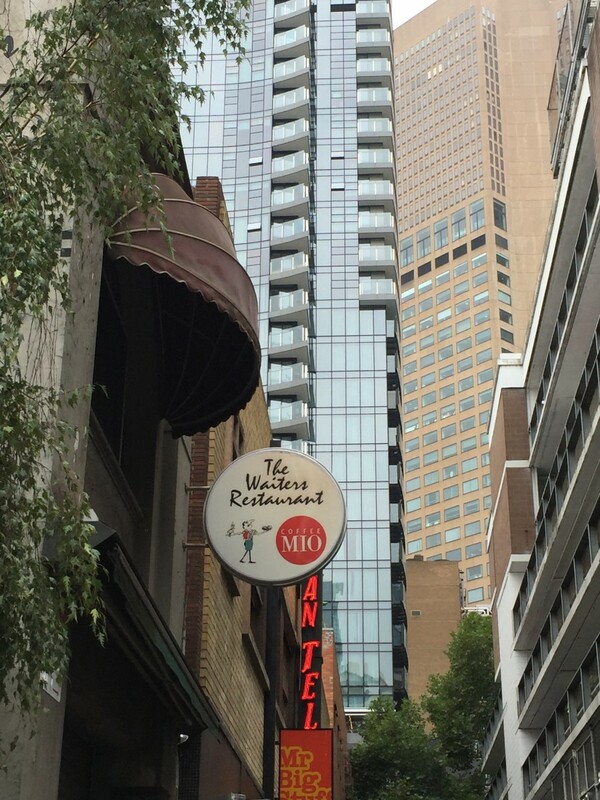 One of the most quirky restaurants in the laneways has to be Waiter’s Restaurant. Originally established in the 1940s as a club for waiters who worked at other restaurants after their notoriously long hours, it now attracts customers who clamber up its famously creaking stairs in search of a one-of-a-kind experience. Greasy Italian food, to provide comfort to the mainly Italians who worked in the restaurant trade of that era and a glass of rough red has now metamorphosed into inverse snobbery. And that is the secret of the laneways of Melbourne. Just as in Chandni Chowk, greasy chhola bhatura that used to be the de facto lunch of the tradespeople who worked in its gallis and kuchas suddenly has acquired cult status. I spent three hours but would have been happier with double that. Hidden Secrets Tours customizes trails depending on your interests (cosmetics, fashion, food and drink, off the beaten track, books etc). It is virtually impossible to see as much on your own. If you do go on your own, do be warned that unlike Chandni Chowk, where all the bags, hardware, photo equipment etc are in one neighbourhood, in Melbourne they’re spread out all over the place. Frequently, one store may be crammed with all sorts of collectibles – easy to miss because you don’t know what you’re looking for until you are actually inside the door. Do not miss Aesop, the cosmetics people: each shop in the CBD has a different theme, all spectacular. Books for Cooks and Spring Street Grocer.